This black series Class 2 Surveyors safety vest is a must have for surveyors or anyone wishing to have a generous number of pockets for storage. Made with ultra-cool heavy duty polyester fabric, with a solid front and mesh back design it is lightweight, breathable and built to perform. The 2″ reflective striping with 3″ contrasting background stripe provides maximum ANSI Class 2 visibility. The front features a zipper closure with durable webbing reinforcement and a black bottom to mask dirt in high contact areas while providing a clean and stylish look. 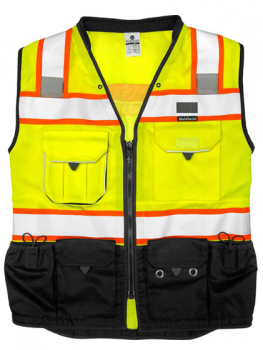 This vest features a left chest 2-tier pocket with dual function flap, a large right gusseted pocket flap, outside lower front pockets with flaps, left and right stake pockets, left and right elastic spray paint can pockets, lower inside right full length zipper pocket with load bearing strap, lower inside left tablet (ipad) pocket with load bearing strap and a hidden back pouch with left and right zipper access. The left and right side of the vest has mic tabs, the lapel features 2 grommets, and the collar is padded for extra comfort.